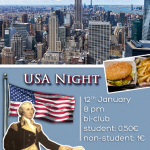 USA Night – ISWI e.V. Burgers, baseball and Hollywood cinema! You may see the USA you’ve come to know on the big screen, but there’s much more to the US-American culture that you’ve never seen. 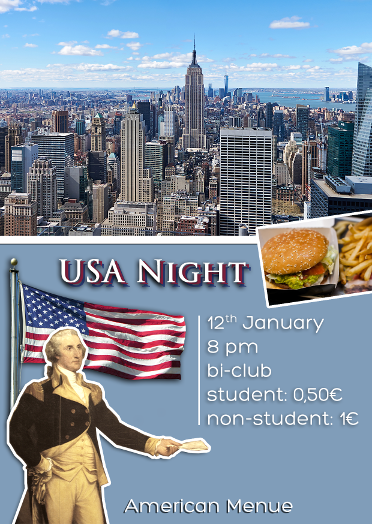 Take a hop across the pond and join us for US-American Night at bi-Club. Chow down on some burgers and fries as we take a cross-country road trip to learn more about the US-American history, music and landscapes. And of course, US-American night wouldn’t be complete without a little bit of two-step! ← Previous Previous post: The application for ISWI 2015 is finally opened! Next → Next post: Application deadline extended to 31st January 2015!